We had a chat with Luke Hyland of Luke Hyland Engineering Consultancy recently about what a busy year 2017 has been for him. In 2017 the Laois Local Enterprise Office relocated back to the Laois County Council buildings at County Hall making some office space available within Portlaoise Enterprise Centre. Luke jumped at the chance to avail of this great opportunity to expand his office and hasn’t looked back since. 2017 also saw Luke shortlisted as one of the Laois county finalists in the IBYE awards (Best Established Business category) which he describes as “an opportunity to meet and network with incredible entrepreneurs and business people”. He was also one of the speakers at the 10th anniversary lunch celebrations at Portlaoise Enterprise Centre where he described how important the Centre had been to him when starting and growing his business. 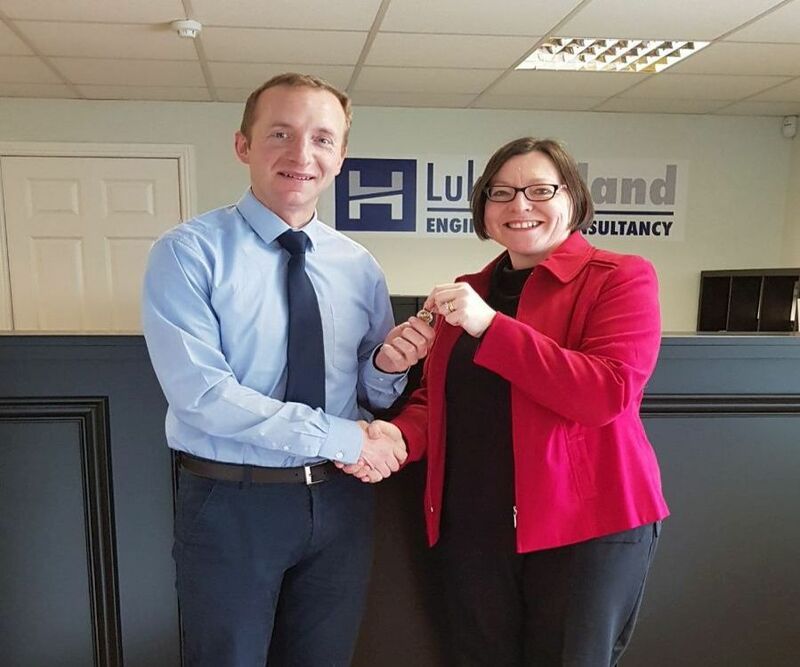 Photo shows our Centre Coordinator Patricia Frayne presenting Luke Hyland with the keys to his new office at Portlaoise Enterprise Centre. We wish Luke all the best in his new office space! If you would like any further information regarding our services please feel free to contact us. This entry was posted in The News! and tagged Luke Hyland, Office Space, Portlaoise Enterprise Centre. Midlands 103 Interviews Portlaoise Enterprise Centre.